This cuff bracelet has seven brightly colored strands, representing the seven chakras. 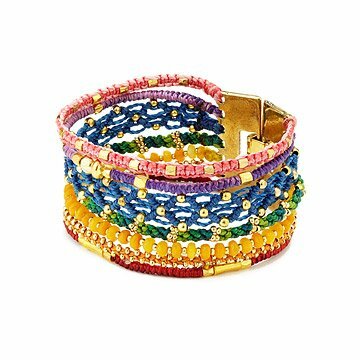 Keep a reminder of the seven chakras on your wrist with this vibrant and playfully textured cuff bracelet. A spectrum of seven strands--each with a unique pattern of knots and brass ornaments--represents the seven energy centers of the body, from Crown to Root. Connected by a hinged brass closure, the seven strands form a unified metaphor: seven meditative points comprising one balanced vision of whole-body wellness. Handmade by a collective of women artisans in Guatemala. Avoid water. Gently clean brass clasp with a soft cloth. Do not use jewelry cleaner. Nice & unique, but it is not as colorful as shown in picture. A little stiffer than expected but is fine. I loved this! Itwas a perfect gjft for my daughter who is socially conscious and responsible but stylish. She liked learning about the artist who created the bracelet too...nice touch! This bracelet is beautiful and comfortable to wear. it matches everything! Beautiful and durable- very satisfied!! The bracelet is of very high quality and looks as good as it does in the pictures of the website. My wife is extremely happy with it. The quality is just as I expected and it looks as good as in the pictures on the website and my wife loves it! Beautiful craftmanship, detail, color, etc... I love the clasp. I plan on buying more for friends in the future as gifts as this seems so well made & the colors are fashionable with so many of the things my friends are wearing these days. All good, I do not usually do surveys. Use it during yoga practice to keep myself centered. Gave one to my yoga buddy too.